Two of my kids have problems with hypoglycemia. One just happens to have a metabolism to die for. The other has been monitored since she was a baby because early childhood hypoglycemia can sometimes turn into diabetes. While I was homeschooling them, it was easy for me to provide healthy well-balanced meals. Then they went to school. I’m not sure if you’re familiar with school lunches (and breakfasts) but they are tremendously carb heavy. Unfortunately, carbs are like the kiss of death for hypoglycemics. They eat carbs, feel full, and then crash in a big way within the hour. It is not pretty. That’s one reason why I can’t understand the pancake breakfast offered free to our school kids the week of testing. I feel like they should be offering a higher protein, lower carb breakfast if they expect the kids to do well during testing. Anyway, back to school lunches. I had 4 kids with different eating preferences packing lunches. I wanted to teach them about packing a healthy lunch but wasn’t sure where to start. 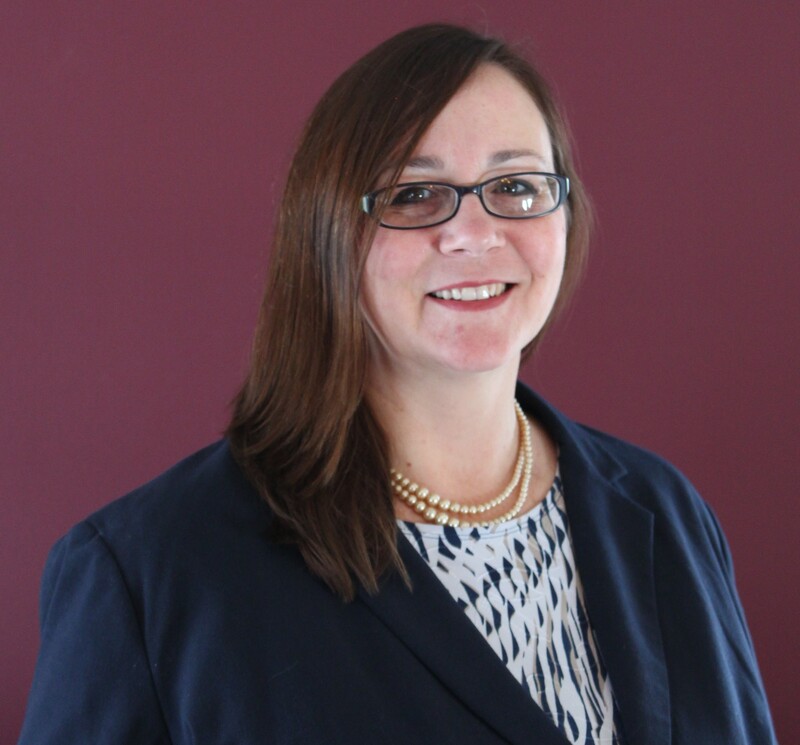 (When I was growing up, my idea of a balanced lunch was one that included a salty snack and a sweet snack to accompany my lunch meat and white bread sandwich. In fact, I spent more time choosing a cool lunch box then picking healthy foods.) Thankfully, I was working with an awesome dietician who had shared a diabetic consistent carbohydrate diet (DCCD) cheat sheet with me. 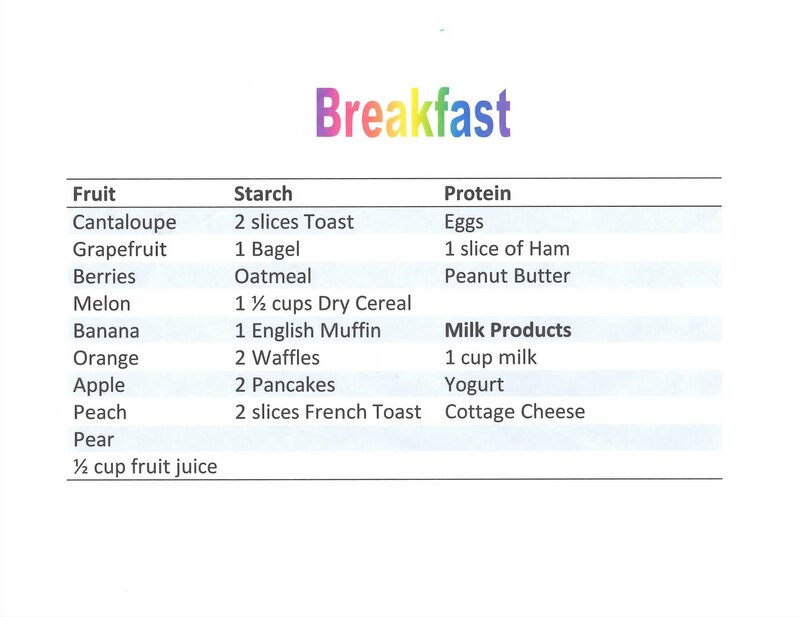 I modified the concept to create a chart to help guide my kids in choosing better-balanced breakfasts and lunches. 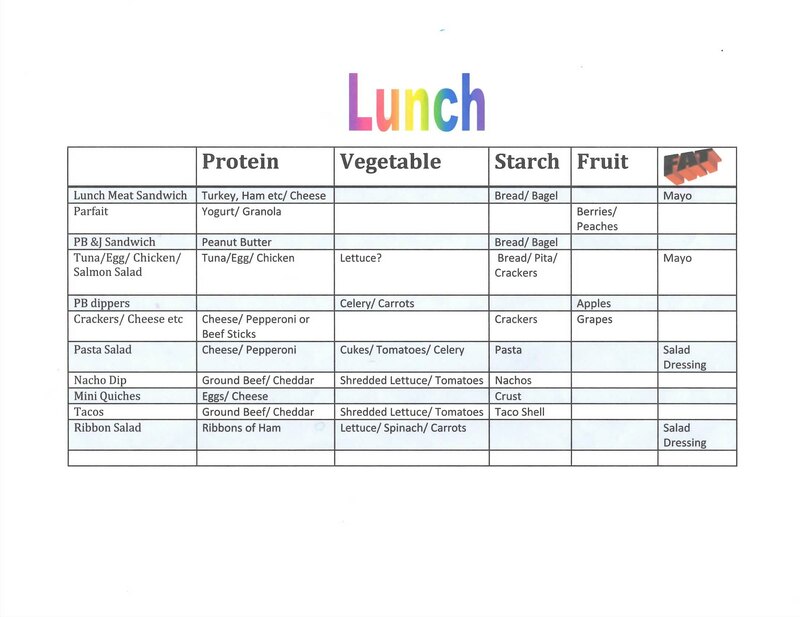 Here’s an idea of some possible lunches and where they fit in. For the empty spaces or other ideas, check out the Fill in the Blank Chart. No need to fill in the empty spaces under the Fats column, we get enough of those in more places than we can imagine. 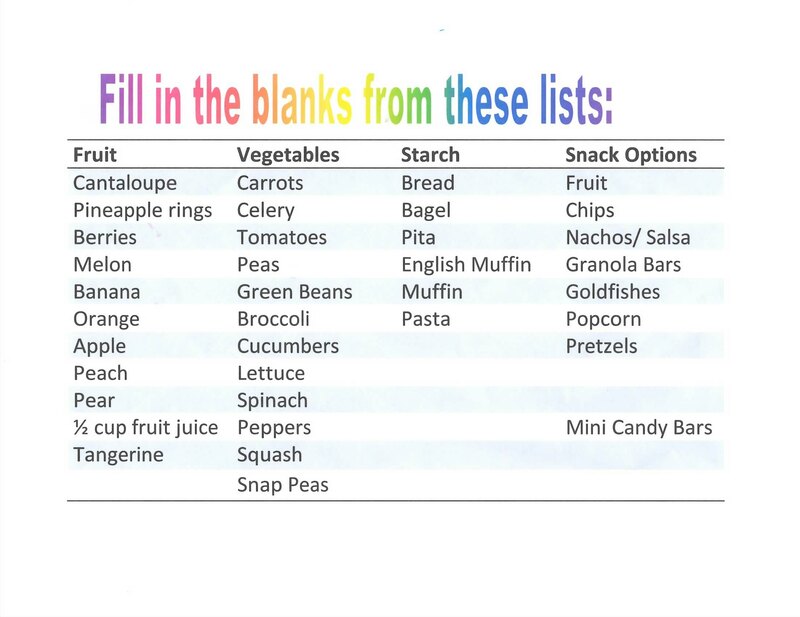 There are so many better options for the snacks but this was my first try and I wanted to include my children’s ideas so they would have some ownership for the project. Hopefully, you’ll find these charts helpful! Have a blessed day!